This is the second Smash Bros. game and I look at it as a huge improvement over the first. 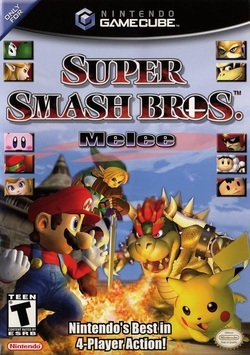 The core gameplay is exactly the same: various Nintendo characters fight in a 2.5D arena with the goal of knocking each other off the stage, but basically everything about the game is better. First, the characters and stages. I felt that the first game suffered due to the fact that there was quite a small selection of playable characters and stages, which meant that it felt as if it really lacked variety. In this game you START with more characters and levels than there are in the other even after you’ve unlocked everything! Plus there is still, of course, a large number of other characters and stages to unlock. One nice new feature in particular is the fact that there are now levels that take you through a route, rather than being stationary platforms, and these are often very fun. Also, all these levels and characters look much better too, the graphics are very nice (last time everything was ugly). Secondly, in this game there is a lot more to do than in the first. Much like the first game, you can fight various characters before eventually reaching a boss (Master Hand), but while that was the only feature in the first, there are lots of other things to do too in this one(and even just doing this takes longer now, as there’re more characters to do it with). This game has an ‘Adventure Mode’ which doesn’t really have a story, but has whichever character you chose going through various levels based on areas from other games (The Mushroom Kingdom, Hyrule etc). Another nice new feature is the large list of missions you can play through: basically in each one you are put into a certain situation and you have to make things go a certain way, sometimes they’re very hard, others very easy, they aren’t fantastic, but they’re good. There is also a third exciting mode that you unlock later, but, I wouldn’t want to spoil it, but needless to say, it is quite fun. The target mini-game (where you are put in a level with target in it, and you need to break them) also returns (with all new levels) and there’s also another mini-game called “Home Run Contest” where you have to hit a character named Sandbag as far as you can, the further he flies, the better your reward. Another new feature which I find absolutely fantastic is the addition of ‘trophies’. These trophies are basically hundreds of different models of characters from throughout the history of Nintendo, all of which are accompanied with a nice block of information about them. You unlock these trophies for all kinds of different things, and they’re a real motivation to at least try everything. It’s a real joy to take a look through your large collection of trophies and to recognise all the characters.